NASA teased everyone last week with the assurance of a “major science discovery” about the Red Planet. So, today they delivered news of a thrilling finding. Using data sent by the Mars Reconnaissance Orbiter (MRO), researchers have spotted proof of salty water flowing on the surface of Mars. Water is, no doubt, one of the crucial elements for life as we know it. We’ve acknowledged for a while that Mars has ice-covered water at its poles, and earlier this year the Curiosity rover discovered the possibility of salty water underneath the Martian surface, but this is the first proof for salt water flowing on the surface. During the warm periods, temperatures on the Red Planet extent nearly -23 to 27 degrees Celsius (250-300 Kelvins, -10 to 80 degrees Fahrenheit) and in order for liquid water to last (even briefly) on the surface of Mars today, it would have to comprise some salt. Both remote and in-situ studies have displayed that numerous salts, for example perchlorates, chlorides and sulfates exist on the Martian surface. These salts can considerably lower both the freezing point and the vaporization proportion of water, and also certainly absorb moistness from the atmosphere. Frequent slope lineae (RSL) – thin, dark streak-like valleys seen slinking down the edges of craters – have been discovered by MRO in low and mid-latitudes on the Marian surface. High-resolution pictures from MRO’s HiRISE camera display that the RSL are normally less than 5 meters (16 feet) wide, appear on slopes throughout the warmer months, increase and disappear during the cooler months. Researchers initially suggested the notion that the RSL could be a creation of cyclical water flows back in 2007, but there was no straight indication to support that until now. Spectral data from MRO’s Compact Reconnaissance Imaging Spectrometer for Mars instrument (CRISM) detected four different sites where the RSL are most extensive. The data exhibited confirmation of three different hydrated salts – magnesium perchlorate, magnesium chlorate and sodium perchlorate – at all four sites, specifying that salty water (also called brine) flows are accountable for the RSL activity. Researchers now recognize that salty water flowing downward is accountable for the RSL, but the main question is, where does the water come from? There are a few prospects, but scientists have yet to narrow it down. The water might form by the melting of surface or subsurface ice, but the possibility of near-surface ice around the equatorial region is slim. Here on Planet Earth, in the Atacama Desert, we are well aware that the deliquescence of definite salts offers the only known refuge for lively microbial communities. If RSL form as a consequence of deliquescence of perchlorate salts, they might have key astrobiological implications. 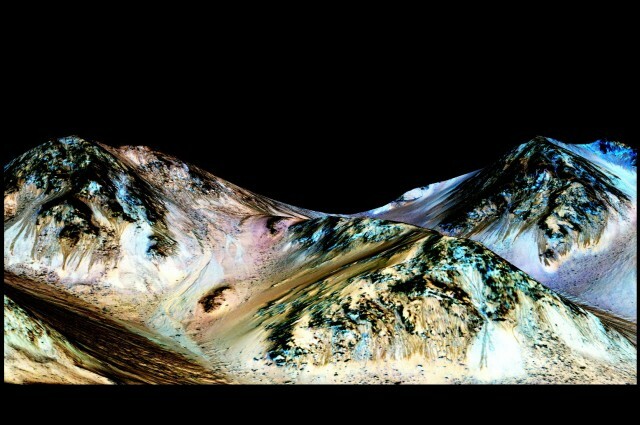 The findings have been issued in Nature Geosciences and deliver new insight into the current Martian hydrologic cycle.